Princess Catherine’s wedding dress was fashion’s best kept secret in the months leading up to the big day. It was handmade by a team of embroiderers at Hampton Court Palace, who didn’t even know Sarah had created it before she was finally publicly announced as the designer. Britain’s Princess Catherine’s wedding dress is set to be displayed in public. Although it is not yet known when or where the ivory gown—which was designed by Sarah Burton of Alexander McQueen—will be kept, the Duchess of Cambridge is keen for people to see the "skilled British craftsmanship" that went into the dress she wore when she married Prince William on Friday (April 29). A spokesperson for Clarence House said: "The Duchess of Cambridge is considering a number of options to give members of the public the opportunity to see, close up, the skilled British craftsmanship that went into the making of her wedding dress by Sarah Burton and her team as well as the Royal School of Needlework." It is thought the dress—complete with lace applique floral detailing and a 2.7 metre train—might be displayed at the Victoria and Album museum in London or Kensington Palace, where a number of gowns worn by the late Diana Princess of Wales have been put on show. 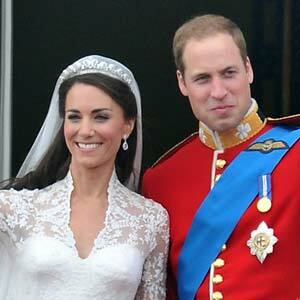 Catherine’s wedding dress was fashion’s best kept secret in the months leading up to the big day. It was handmade by a team of embroiderers at Hampton Court Palace, who didn’t even know Sarah had created it before she was finally publicly announced as the designer. The lace design was hand-engineered using Carickmacross lace-making techniques developed in Ireland in the 1820s. The individual flowers—thistles, roses, daffodils and shamrocks—were hand-cut from Chantilly lace and engineered onto ivory silk tulle. HOUSEWIFE. Meanwhile, Princess Catherine will become a housewife to new husband Prince William. The royal will not be undertaking public engagements alone for the foreseeable future and has chosen to stay at the couple’s rented farmhouse in Anglesey, Wales, while William works as a search-and-rescue pilot. The only events in her calendar include watching Prince William play in a number of polo matches and the Duke of Edinburgh’s 90th birthday. A source said: "The couple will do things as a pair after their marriage and for the foreseeable future. Catherine will not be conducting any solo engagements. The number of engagements she does with William will remain pretty level. "Prince William has a full-time job he has to work round and that is his priority. He is committed to it for at least another two years so nothing much will change in the immediate future, apart from the fact that he and Catherine will take part in the queen’s Diamond Jubilee celebrations next year." However, she is expected to eventually undertake her own royal duties and support charities separately from the duke. The source added to Britain’s Daily Mail: "She will, in time, become associated with her own charities but this won’t happen immediately as she wants to explore the fields that interest her first."